The word that’s enticing enough to bloggers and website owners indulge in this offence of using others’ content without giving them their due credits (no matter you do it with full conscience, or it is an act of unintentional plagiarism). In academics, plagiarism is also a non-forgivable offence and if caught (which is easy with the use of the best plagiarism checkers ) can lead to students getting expelled or even terminated from the academic course/college. For bloggers, effects of plagiarism might lead to loss of website credibility and even Google penalty that leads to ranking lose. If you’re looking for ways to avoid plagiarism let’s discuss how to avoid plagiarism (both intentional & unintentional plagiarism) for the greater good. What is Plagiarism & What Does Plagiarism Mean? How To Avoid Plagiarism? Helpful Tips & Tricks To Prevent Plagiarism For The Good. 7) How to paraphrase correctly and avoid plagiarism while paraphrasing? 8) How to avoid plagiarism when quoting a source? According to Wikipedia, plagiarism is the “wrongful appropriation” and “stealing and publication” of another author’s “language thoughts, ideas or expression” and using them as your original work. Wondering why is plagiarism such a big deal and how is it wrong? Well, plagiarism not only voids the rights of creators for their creative work it is a serious issue for academic institutions. Below are some of the harmful effects of plagiarism. Students indulge in academic dishonesty by copying or using the internet and elsewhere to complete their paper or essay which if caught can result in lower grades and in the worst case, failures and suspension. Professors and academic librarians very easily detect traces of copied content and now use sophisticated plagiarism checker tools like Grammarly and Turnitin for plagiarism detection. These tools display the percentage of plagiarized content accurately making it further hard to avoid plagiarism detection. That is why preventing plagiarism in education is very essential. In this article, we’ll discuss some of the most efficient ways to prevent or avoid committing plagiarism. Ready to submit papers that are free from duplicate content and plagiarism? Now that you know the negative effects of plagiarism on the students and their educational career, let us see how to avoid plagiarism in academic writing and research papers. Preventing plagiarism is easy, you just need to be disciplined and honest. 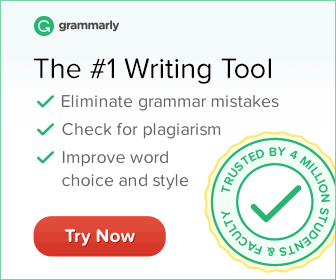 Offer ›› Save more on Grammarly (best grammar and proofreader tool)! Check out our exclusive Grammarly coupon. One of the potential causes of plagiarism is procrastination. If you’re one of those who pushes their writing assignments far close to the deadlines, chances are you are more prone to committing plagiarism. One might say, I am full vigilant and will not use other’s content as my own which is a good thing, but you’ll agree that when you are in a hurry, you tend to become careless and might make mistakes while citing someone’s research or paraphrasing which is equal to plagiarism. Plan the outline of your writing assignment as soon as you get it. If you aren’t assigned a topic for your essay, find one while you still have enough time. Assign a secondary deadline which is a week earlier than that allotted to you in your university. Conduct research & draft the first outline. Complete the paper before the secondary deadline so that you have enough time to proofread, check your citations, add bibliography etc. When doing extensive research, it is easy to miss out a few sources. That is why you should take notes when researching for your academic paper. You can also use a free tool like pocket (chrome extension) or evernote web clipper to save your online raw research data. Web clipper makes it easy to clip a particular part of a website which makes it easy to refer back and attribute it. Note: Sometimes, information on the web gets periodically updated to add new valuable content so make sure you have a printed copy of the web page to back up what you have cited at the time of question. You can also create a rough bibliography offline so that you have access to it 24/7. When researching, chances are you might find some useful information via online sites like Wikipedia, a related forum or blog. It is essential you cite them in your writing too to avoid plagiarism totally. Blogs generally have thoughts of the author and in any case, the writer finds your work online, they can file a DMCA against you. So, it is always wise to give a link back to them or add the URL in the bibliography just as Wikipedia does. The image below shows how efficiently Wikipedia cites the sources of their information. The above style of crediting sources not only looks professional but also helps them prevent unintentional plagiarism. Did you include some excerpts from a private, offline conversation to your research paper? Often, we find bright ideas when discussing a topic with friends or professors. It is a good idea to include them in your essay or paper if it adds value. Now the question “how do I write about another’s ideas” arises, right? Since these are offline discussions they might not be detected as copied content but what you do when you know you won’t get caught speaks a lot about your integrity. It is always good to show courtesy to the one whose words/ideas contributed to your research. Quote the phrase as a standard quotation with the name of the person who discussed it. It doesn’t have to be a link or a website URL. The name of the individual who said it in the attribution is enough to impress your professors with your honesty and professionalism. Best comma checker tools online. Best proofreading tools that will make you a pro writer instantly. When in doubt about whether to credit a source or not, ask your professor or E&D instructor. If at all you are confused whether or not to cite a source, stop assuming and ask. Getting a clear directive from your E&D instructor or professor is always the safest way to avoid plagiarism. Having that “how do I copy and paste without plagiarizing” feeling? The direct answer to avoid copy and paste plagiarism is to use quotation marks around the sentence or extract you are copying and pasting. If you are copying from a source that has more than four typed lines of content, use a blockquote. Another legal and accepted way of copying and pasting without plagiarizing is by the use of points of ellipsis (also called suspension points) which signifies omission of certain words to keep the extract shorter. This is an excellent way to summarize without plagiarizing. Paraphrasing is the act of expressing the meaning of a piece of information found elsewhere without copying the exact text verbatim. When you write a research paper or an essay, you often have to acquire and use the information you find from various sources (like books, blogs, journals, periodicals, Wikipedia etc.). The process of representing this information in your essay using your own wording without copying as is is called paraphrasing. When you quote a source, you copy the whole information verbatim and place them in your paper within quotation mark. For longer passages of text you place the quoted text in an indented format to distinguish it from your own text. While in paraphrasing, you rephrase the whole passage in your own words to represent the same meaning as in the original passage. You, of course, have to cite the source to still prevent yourself from the plagiarism sin. How to prevent plagiarism while paraphrasing? Credit the source: Paraphrasing is using someone’s ideas in your own words, do not run away without crediting the source. Make sure to include the source of the passage somewhere in your paraphrase or immediately above or below it. 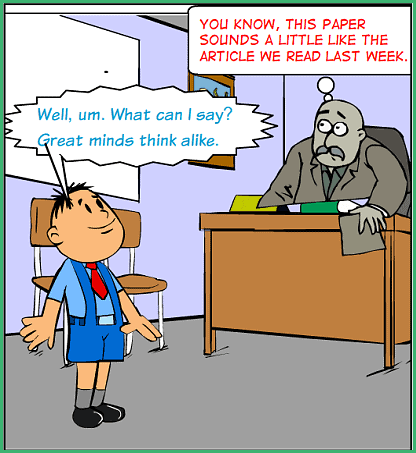 No copying verbatim: Make sure you do not have many similarities with the original source or else you can opt for quoting it instead. You should also not just copy the source by omitting certain words. Quote unique phrases: Sometimes, a passage might include certain wordings (often, not more than 3-4 words) that are better to keep as is. Make sure your passage has them as is but under the quotation marks. For example, Mary said, the mob rallied the streets since morning shouting the slogan, “pollution kills”. You should not be rephrasing pollution kills with anything else like pollution is harmful or pollution is toxic. When you quote a source, you represent the exact wording but within quotation mark. This process is called quoting a source. Place the passage within quotation marks (“”) and if the passage is a bit longer, it is advisable to add an indentation (or block quote) to the block of text. Cite the author in the same sentence as the quote. Use points of ellipsis with spaces ( … ) if you omit some text/words and place brackets ( [ ] ) when adding words to help identify the subject/object or anything that helps the reader understand the context of the quote. Professors and academic professionals take plagiarism seriously. Most of the teachers get a hold of what type of plagiarism students commit. The icing on the cake is, they now use professional plagiarism checker tools to accurately evaluate your papers and rate the percentage of plagiarized content accurately. How do you prevent plagiarism in your essays? What can you do to prevent plagiarism? With all those tips to avoid plagiarism in your research papers and academic projects, you sure can make your paper more original and free from duplicate content. But, here is another way to avoid the slightest chance of the existence of duplicate content in your submissions. 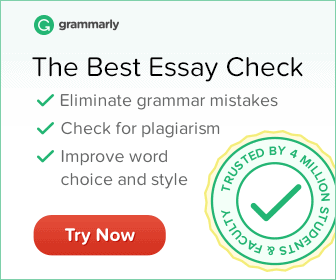 You can pass your drafts through any of these best plagiarism checker tools before the final submission and see for yourself if it has plagiarized content. Out of all those tools, Grammarly is our favorite since it detects plagiarism and tells you the exact percentage of duplicate content in your document. Try it out or read my Grammarly review to know more! You can also avail Grammarly student discount coupon here. Certainly, agree that Grammarly is everyone’s favorite! The writer’s tool of the century!